This might be another strange one for you all as many people aren't aware of how beneficially nuticious this food is; you've probably eaten it in Indian dishes or know of it from a common Greek dip it's often made into... Any guesses?! • They have an extremely high fibre content (just two cups provide your whole RDA)! It is noted on WHFoods that the fibre provides in chickpeas could be more beneficial than other fibre at regulating blood fat levels and lowering cholesterol. • The majority of this fibre is insoluble which can reduce the risk of colon cancer. • They are filling and leave you satisfied for longer after finishing your meal (great for people watching their weight!). • Including chickpeas in your diet helps to regulate blood sugar levels and insulin secretion (useful for people with diabetes). • There is little difference, nutritionally, between uncooked chickpeas and the readily cooked canned variety (these are a great time and money saver)! • Chickpeas are extremely high in antioxidants including flavonoids and the mineral manganese; as well as being an excellent energy source, these antioxidants are believed to reduce the risk of heart disease (in particular coronary heart disease). • Chickpeas are low in fat but the fat which they do provide is mostly polyunsaturated and full of omega 3. • Chickpeas are a great source of protein and their high iron content provides a great alternative to meat in vegetarian (and vegan) meals. • As well as iron and manganese, chickpeas are also surprisingly high in calcium; magnesium which relax the veins and arteries; folate and molybdenum (useful for the metabolism of fats and carbs in the body). • 100g of chickpeas contains only 110 calories and 1.1g of fat but provides 20% of your fibre RDA, 15% of your protein intake and 15% of your iron. Here are a few of my favourite chickpea recipes, including the obvious hummus! This recipe is so easy but healthy and delicious at the same time! I had tried to use that new vine app (anyone else got that yet?) to show how I made it but I took the full video and it never saved! So here's a step by step guide with pictures! 1. In a blender, combine 125g drained chickpeas, 1 large grated carrot, 1 crushed garlic clove, 1/2 tsp cumin, a sprinkle of paprika and some freshly ground salt and black pepper. 2. Make into two patties and place on a greased baking tray, drizzling a bit of olive oil/ rapeseed oil on top. Put under a pre-heated medium grill for 10 minutes, flipping over halfway through. 3. Meanwhile, scrunch up a sheet of greaseproof paper and rinse in water. Flatten out and place pitta bread in the centre, sprinkling oregano, basil, garlic powder, salt and pepper on top. Wrap the pitta bread loosely in the greaseproof paper and place in the oven (if your grill is in the oven that is!) for 5 minutes. This sounds crazy but trust me, last night was the first time I tried heating up my pitta bread using this method and it tasted exactly like the ones I get at home; so flavourful! (I thought I would try it out after remembering a Jamie's 15 minutes meal episode I had once watched)! 4. 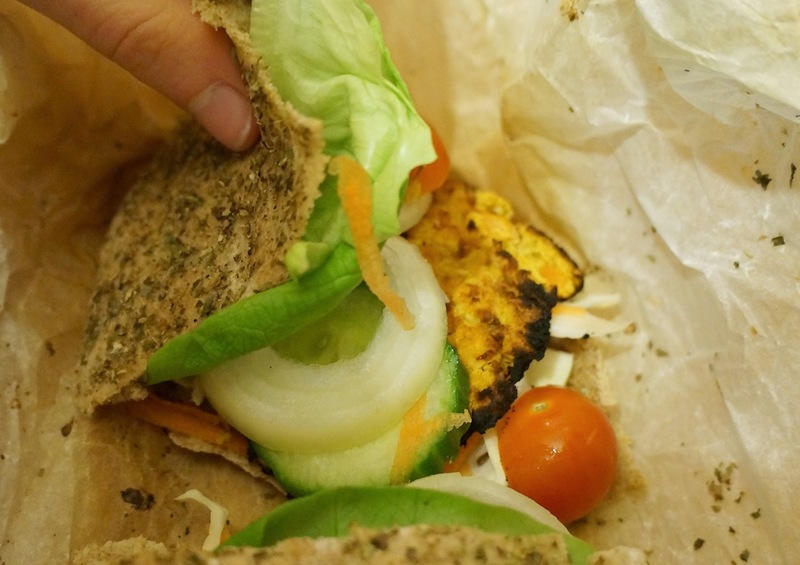 When everything is cooked, cut the pitta bread in half and stuff with some salad (lettuce, cabbage, carrot, cucumber, cherry tomatoes, onions etc) and your chickpea falafel burgers! A warning: this is impossible to eat without dropping any! Slice up 1 large red pepper and 1 large yellow pepper and lay out on a serving tray. To make the Hummus, blend together 400g drained can chickpeas, 3tbsp water, juice of 1 lemon, 2 crushed garlic cloves, 3 tbsp olive oil, 1/2 tsp cumin and seasoning until a thick but spreadable consistency is achieved. For better presentation, put hummus into a piping bag and pipe a dollop on each pepper boat. Serve with remaining Hummus. 1. Heat oil in a wok and add the chicken. Sauté for 5 minutes, turning until browned, before adding onion, mushroom, courgette, garlic, cumin, coriander, oregano, red pepper and tobasco. Stir-fry for 3 minutes over a medium heat before adding the chickpeas and pouring in the stock. Season to taste and bring to boil. Cover and simmer for 5-10 minutes. 2. Meanwhile, cook noodles in boiling water for 4 minutes. For the last 2 minutes, add the cabbage and courgette to a steamer and place on top of the noodle pot to steam. Drain noodles over the cabbage and courgette and divide amongst two bowls. Top with chilli chicken and broth. A little hint; it tastes so much better when eaten with chopsticks. But then in my opinion, so does everything!! And Of Course... Salad with Roasted Veg and Chickpeas! Basic salad topped with dry-roasted or grilled: chickpeas, pepper, chopped cherry tomatoes and onion sprinkled with oregano. I usually have the Cypriot dressing with this: a bit of extra virgin olive oil, vinegar, freshly squeezed lemon and dried oregano. Do you like chickpeas? Did you know they had this many health benefits?! Any recipes to add? Definitely going to try a few of these recipes.........maybe all of them!